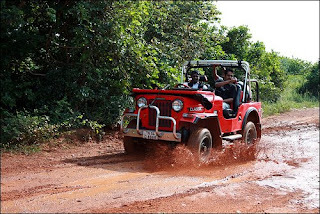 Indian Jeepers pride Mahindra Classic and me had a great experience yesterday in TADA. I was with Chennai Photography Club (CPC) guys for photo trip in TADA. After crossing the forest check/toll post for entry fees, we were driving in 1 jeep and 2 cars(SX4 and WaganR). As a jeep enthusiastic, I had all my plans set for an solo offroad done at the forest range. While everyone was in cars, we four guys accompanied in the jeep already got to know the essence of open top jeep. I noticed a civil work to create new water channel on the way towards parking lot in TADA. The canal was around 25-30ft deeper and they cut the water channel live V shape. One side of the V cut was filled with loose soil and other side was white colored rocks. 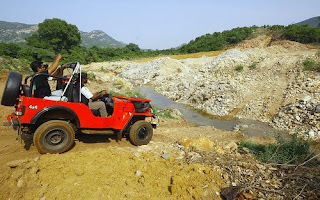 That is what attracted me, I remember the lessons learned during my Kelambakkam trip with Jeep Thrills. So, no more further thinking and my jeep was all set descending into the deep channel, The people around thought it was accident and I had a big crowd around. Some people said(thought?) it was some shooting as all of my CPC team guys had cameras. Jeep went well on the descending path which was loose soil, after which the water crossing then I have to climb up on the other side, you know what it was too steep.. Once I was really afraid if I can make it, also none from the group know offroading fundas(otherwise I don't have option). Somehow I made my mind and started climbing upwards. once during the climb in a place my tyres started spinning hence I put on reverse gear and went little back and came up again and again three times and the third time the jeep picked up and I was on the right movement. Ohhh my luck didn't stay with me for very long when my jeep about to reach to top the clutch was suddenly became dead and I was totally out of the clutch but managed to reach the top. I'm in the forest side without clutch and no one can help.. I couldn't figure out the issue on that location. hmmm so I made my mind to try the real hard offroading now steep descending and ascending without clutch. The whole team started seeing the scene with climax effect.. If I can't make it, the jeep will be left in the water channel till I can bring a mechanic from 20kms outside the location. I put the jeep in 4WD low and 1st gear, and cranked the engine and started moving, Listen carefully I just engaged the gears before starting the engine and started moving down no issues and everything went well on the descend path. While crossing the water channel I noticed the loose soil side near the water channel was too high for the tyre to climb and I had no clutch, so no much time to invent alternate path. so I rushed the jeep accelerator, the wheel started spinning in the loose soil and water made my way to get traction, wow jeep is on the ascending path.. I felt the thrill now and started pushing the acceleration little high. Probably now that is made a negative effect as the wheels started spinning on the climb, The spinning wheels made me go down on the back side in sliding mode, I was about to hit the water with the jeep and before the last second again the wheels gained the traction and started going upwards Ohhhhhh ooooohhh jeep is now going smooth and reached the top. After coming up.. using the same technique I drove the jeep towards the parking lot and you know what, I became half mechanic with one more mechanical engineer's assistance (who was part of our CPC). We both went under the jeep finding the issue and found the yoke rod that is fitted between gearbox and the chase rail lost the nut and it was hanging. That is the issue, as i tcouldn't provide required tension to the clutch assembly to work. So we tried ourselves to fix the issue and hurray .. We were on the success path after an hour long under body mechanical work. There were lots of videos and photos of my TADA offroading taken by folks traveled with us, as I was driving all the time, picture and videos were made out my CPC friend's cameras, will update the pictures and videos as soon as getting the emails from my friends.